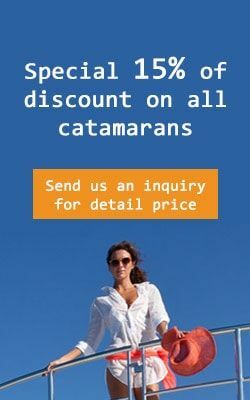 Charter catamaran Nautitech 40 for rent in Greece and let us catapult you away for an unforgettable charter journey along the Greece islands from Athens, Lavrion, Mykonos, Lefkada but soon from all bases in Greece. Available for catamaran Crewed with our professional crew this all new sailing yacht can be rented for one way charters to and from Athens to Mykonos or Santorini as well as other famous islands subject to availability. Send us an Inquiry right now to secure top prime dates avoiding disappointment later or availability risks. This yacht is available for rent in all regions with Catamaran Charter Greece! Galley : Gas stove & oven , Electric fridge , Icebox , Cuttlery – Kitchen equipment , Pans, plates, glasses, spoons, knifes, etc. - By using this form you agree with the storage and handling of your data to propose the best offer. Your date will not be used for any other purpose. According with the European regulation (GDPR) Catamaran Charter Greece / Cusmanich d.o.o. is protecting the data of the costumers.